A presidential candidate with a history of beating incumbents, rewriting electoral rules and upsetting political expectations. Burlington, Vermont— For the first century after the founding of the Grand Old Party in 1854, Republicans dominated the politics of the state of Vermont like no other. For more than 100 years, Vermont Republicans won every major race for every statewide office. Republican presidential candidates from John Fremont in 1856 to George H.W. Bush in 1988—with the single exception of Barry Goldwater in 1964—won the Green Mountain State. For one of Vermont’s US Senate seats, an unbroken Republican winning streak continued from before the Civil War to the beginning of the 21st century. Only in 2006 was the Senate seat streak broken with the election of a candidate who was not a Republican. Of all the announced and potential contenders for the 2016 Democratic presidential nomination, none has a longer track record of taking on tough races, beating incumbents, and upsetting the political calculus. Sanders has won 14 elections in Vermont, including ten straight races for the US House and US Senate as the most politically successful and longest serving independent member of Congress in American history. That does not mean that Sanders, who today will formally launch his first presidential campaign, is anything other than a longshot in the 2016 Democratic contest. The proud democratic socialist is the first to acknowledge that it would take “a political revolution” for him to win the nomination, let alone the presidency. Yet those who dismiss Sanders as the product of what they presume to be the steadily liberal politics of a small New England state do not know much about the electoral history of Vermont or about the role that Bernie Sanders played in reshaping the state’s politics. Sanders played a critical role in forging Vermont’s progressive reputation as an outsider candidate who beat incumbents, won statewide races when Republicans were taking the other top jobs, and upset partisan patterns that once seemed to be locked in stone. He has done so by audaciously challenging both major parties—defeating a Democratic mayor of Burlington in his first winning race and defeating a Republican congressman a little less than a decade later. Sanders has won Democratic primaries several times and then refused the nomination in order to pursue a November run as an independent. Now he seeks to win Democratic presidential primaries in a race with front-runner Hillary Clinton. Sanders has to say that because, of course, political and media elites do tend to count presidential candidates like him out. Insurgents with track records of voting against wars and domestic spying and tax breaks for the wealthy are often dismissed. And when outsider candidates talk about breaking up big banks, taxing Wall Street speculators, providing free college education, and lifting the spell of austerity, the insider narrative invariably warns that they are too bold, too idealistic, too radical. But Sanders likes to challenge political expectations. He is willing to go against all odds, as he did as a third-party candidate for governor and US senator from Vermont, running on the ballot line of the proudly left-wing Liberty Union Party. Sanders lost those races, but he made a name for himself as progressive who knew the issues. And when he challenged expectations again in 1981, as an outsider leading a dissident coalition of Burlington’s workers, students, small-business owners, and low-income families, he beat the veteran Democratic mayor by 10 votes. The breakthrough came in 1990, when Sanders beat Republican Congressman Peter Plymouth Smith, a well-regarded former lieutenant governor whom many saw as the rising star of the state’s GOP. Even though a Democrat peeled off a portion of the vote, Sanders secured 56 percent to Smith’s 40 percent. That was the first time a Republican incumbent had been beaten in a general election for a Vermont US House seat since the founding of the Republican Party—and only the second time that a non-Republican had won a seat since 1854. Though his was a breakthrough win, Sanders did not serve cautiously. Rather, he served as a steady progressive, earning top ratings from labor, environmental, and civil-rights groups; playing a vital role in forming the Congressional Progressive Caucus; voting against free trade deals, the Patriot Act and the authorization of George W. Bush’s use of military force in Iraq. And he was steadily r-elected, surviving the “Republican wave” year of 1994 and pushing his percentages into the high 60s, even as Republicans were winning other statewide posts. 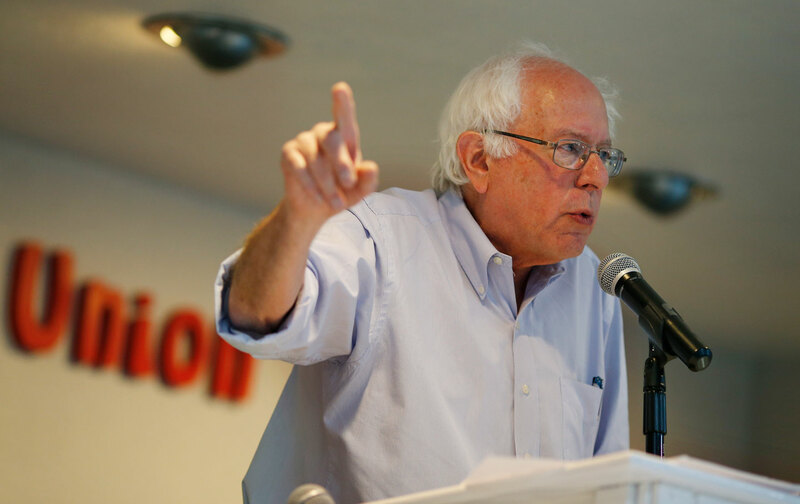 When Vermont Senator Jim Jeffords, a Republican who turned independent in his last term, announced that he was stepping down in 2006, Sanders jumped into a race that a number of Democrats would have liked to run. He won the Democratic primary and then declined the nomination, mounting an audacious independent run that was not supposed to be easy. Sanders faced a wealthy Republican who poured more than $7 million into the race, much of it spent on a crude negative advertising campaign. Though he was outspent and attacked, Sanders secured 65 percent of the vote in November, 2006. Notably, he did so at the same time that the state was re-electing a Republican governor. He was re-elected six years later with 71 percent of the vote. Of the Democrats who are running—or who might run—this year for the presidency, most have notable track records of taking on tough races and winning. Hillary Clinton waded into the big-elbows world of New York politics, scared off the likes of then–New York Mayor Rudy Giuliani, and easily won a Senate seat in 2000. Martin O’Malley beat the incumbent Republican governor of Maryland in 2006 and was re-elected in the Republican-wave year of 2010. Jim Webb beat Virginia Republican Senator George Allen in 2006. Lincoln Chafee was elected governor of Rhode Island in 2010 as a progressive independent. But Bernie Sanders has a distinct record of upsetting the political calculus—so distinct that, when he says “Don’t underestimate me,” he means it.